Neuromorphic engineering, also known as neuromorphic computing, is a concept developed by Carver Mead, in the late 1980s, describing the use of very-large-scale integration (VLSI) systems containing electronic analog circuits to mimic neuro-biological architectures present in the nervous system.In recent times the term neuromorphic has been used to describe analog, digital, and mixed-mode analog/digital VLSI and software systems that implement models of neural systems (for perception, motor control, or multisensory integration). Neuromorphic engineering, also known as neuromorphic computing, is a concept developed by Carver Mead, in the late 1980s, describing the use of very-large-scale integration (VLSI) systems containing electronic analog circuits to mimic neuro-biological architectures present in the nervous system. In recent times the term neuromorphic has been used to describe analog, digital, and mixed-mode analog/digital VLSI and software systems that implement models of neural systems (for perception, motor control, or multisensory integration). The implementation of neuromorphic computing on the hardware level can be realized by oxide-based memristors, threshold switches and transistors. A key aspect of neuromorphic engineering is understanding how the morphology of individual neurons, circuits, applications, and overall architectures creates desirable computations, affects how information is represented, influences robustness to damage, incorporates learning and development, adapts to local change (plasticity), and facilitates evolutionary change. Neuromorphic engineering is an interdisciplinary subject that takes inspiration from biology, physics, mathematics, computer science and electronic engineering to design artificial neural systems, such as vision systems, head-eye systems, auditory processors, and autonomous robots, whose physical architecture and design principles are based on those of biological nervous systems. Neurogrid, built by Brains in Silicon at Stanford University, is an example of hardware designed using neuromorphic engineering principles. The board is composed of 16 custom-designed chips, referred to as NeuroCores. Each NeuroCore’s analog circuitry is designed to emulate neural elements for 65536 neurons maximizing energy efficiency. The emulated neurons are connected using digital circuitry designed to maximize spiking throughput. As early as 2006, researchers at Georgia Tech published a field programmable neural array. This chip was the first in a line of many increasingly complex arrays of floating gate transistors that allows programmability of charge on the gates of MOSFETs to model the channel-ion characteristics of neurons in the brain and was one of the first cases of a silicon programmable array of neurons. In November 2011, a group of MIT researchers created a computer chip that mimics the analog, ion-based communication in a synapse between two neurons using 400 transistors and standard CMOS manufacturing techniques. In June 2012, Spintronic Researchers at Purdue presented a paper on design for a neuromorphic chip using lateral spin valves and memristors. They argue that the architecture they have designed works in a similar way to neurons and can therefore be used to test various ways of reproducing the brain’s processing ability. In addition, they are significantly more energy efficient than conventional chips. Research at HP Labs on Mott memristors has shown that while they can be non-volatile, the volatile behavior exhibited at temperatures significantly below the phase transition temperature can be exploited to fabricate a neuristor, a biologically-inspired device that mimics behavior found in neurons. In September 2013 they presented models and simulations that show how the spiking behavior of these neuristors can be used to form the components required for a Turing machine. A research project with implications for neuromorphic engineering is the Human Brain Project, a 10 year collaboration that is attempting to simulate a complete human brain in a supercomputer using biological data. It is made up of a group of researchers in neuroscience, medicine, and computing. Henry Markram, the project’s co-director, has stated that the project is proposing to establish a new foundation, to explore and understand the brain and its diseases, and to use that knowledge to build new computing technologies. The three primary goals of the project are to better understand how the pieces of the brain fit and work together, to understand how to objectively diagnose and treat brain diseases, and to use the understanding of the human brain to develop neuromorphic computers. The simulation of a complete human brain will take supercomputers a thousand times more powerful than today’s, and thus the focus on neuromorphic computers. $1.3 billion has been allocated to the project by TheEuropean Commission. Another research project with implications for neuromorphic engineering is the BRAIN Initiative. Neuromemristive systems are a subclass of neuromorphic computing systems that focus on the use of memristors to implement neuroplasticity. While neuromorphic engineering focuses on mimicking biological behavior, neuromemristive systems focus on abstraction. For example, a neuromemristive system may replace the details of a cortical microcircuit’s behavior with an abstract neural network model. There exists several of neuron inspired threshold logic functions implemented with memristors that has applications in high level pattern recognition applications. Some of the applications reported in recently include speech recognition, face recognition and object recognition. They also find applications in replacing conventional digital logic gates. ^ Monroe, D. (2014). “Neuromorphic computing gets ready for the (really) big time”. Communications of the ACM 57 (6): 13–15. doi:10.1145/2601069. ^ Zhao, W. S.; Agnus, G.; Derycke, V.; Filoramo, A.; Bourgoin, J. -P.; Gamrat, C. (2010). “Nanotube devices based crossbar architecture: Toward neuromorphic computing”.Nanotechnology 21 (17): 175202. doi:10.1088/0957-4484/21/17/175202. PMID 20368686.
a^ b^ Pickett, M. D.; Medeiros-Ribeiro, G.; Williams, R. S. (2012). “A scalable neuristor built with Mott memristors”. Nature Materials 12 (2): 114–7. doi:10.1038/nmat3510.PMID 23241533. ^ Zhou, You; Ramanathan, S. (2015-08-01). “Mott Memory and Neuromorphic Devices”. Proceedings of the IEEE 103 (8): 1289–1310. doi:10.1109/JPROC.2015.2431914.ISSN 0018-9219. ^ Boddhu, S. K.; Gallagher, J. C. (2012). “Qualitative Functional Decomposition Analysis of Evolved Neuromorphic Flight Controllers”. Applied Computational Intelligence and Soft Computing 2012: 1–21. doi:10.1155/2012/705483. ^ Waldrop, M. Mitchell (2013). “Neuroelectronics: Smart connections”. Nature 503 (7474): 22–4. doi:10.1038/503022a. PMID 24201264. ^ Benjamin, Ben Varkey; Peiran Gao; McQuinn, Emmett; Choudhary, Swadesh; Chandrasekaran, Anand R.; Bussat, Jean-Marie; Alvarez-Icaza, Rodrigo; Arthur, John V.; Merolla, Paul A.; Boahen, Kwabena (2014). “Neurogrid: A Mixed-Analog-Digital Multichip System for Large-Scale Neural Simulations”. Proceedings of the IEEE 102 (5): 699–716.doi:10.1109/JPROC.2014.2313565. ^ Suh, Taeweon; Lee, Hsien-hsin S. (Feb 2006). “Initial Observations of Hardware/Software Co-Simulation using FPGA in Architecture Research” (PDF). Workshop on Architecture Research using FPGA Platforms in conjunction with International Symposium on High-Performance Computer Architecture. Retrieved 28 Jul 2015. 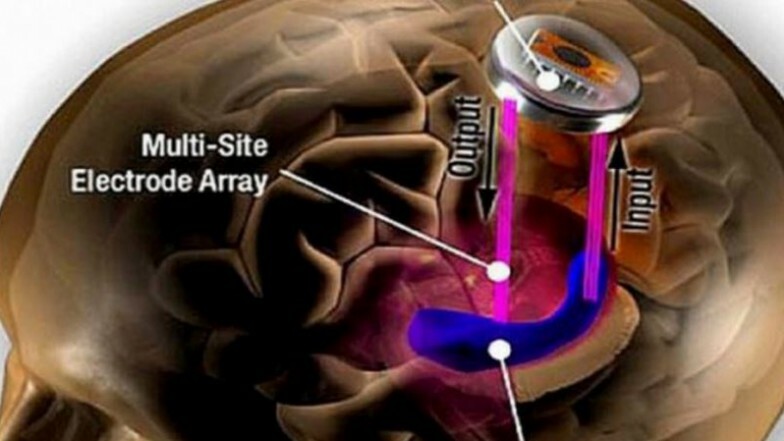 ^ “MIT creates “brain chip””. Retrieved 4 December 2012. ^ “Neuromorphic silicon neurons and large-scale neural networks: challenges and opportunities”. doi:10.3389/fnins.2011.00108/full (inactive 2015-09-22). Retrieved 4 December 2012. ^ “Proposal For Neuromorphic Hardware Using Spin Devices”. arXiv:1206.3227. Retrieved 4 December 2012. ^ “Involved Organizations”. Retrieved 22 February 2013. ^ “Human Brain Project”. Retrieved 22 February 2013. ^ “The Human Brain Project and Recruiting More Cyberwarriors”. Retrieved 22 February 2013. ^ C. Merkel and D. Kudithipudi, “Neuromemristive extreme learning machines for pattern classification,” ISVLSI, 2014. ^ Maan, A.K. ; James, A.P. ; Dimitrijev, S. (2015). “Memristor pattern recogniser: isolated speech word recognition”. Electronics Letters 51 (17): 1370–1372.doi:10.1049/el.2015.1428. ^ Maan, Akshay Kumar; Kumar, Dinesh S.; James, Alex Pappachen (2014-01-01). “Memristive Threshold Logic Face Recognition”. Procedia Computer Science. 5th Annual International Conference on Biologically Inspired Cognitive Architectures, 2014 BICA 41: 98–103. doi:10.1016/j.procs.2014.11.090. ^ Maan, A.K. ; Kumar, D.S. ; Sugathan, S.; James, A.P. (2015-10-01). “Memristive Threshold Logic Circuit Design of Fast Moving Object Detection”. IEEE Transactions on Very Large Scale Integration (VLSI) Systems 23 (10): 2337–2341. doi:10.1109/TVLSI.2014.2359801. ISSN 1063-8210. ^ James, A.P. ; Francis, L.R.V.J. ; Kumar, D.S. (2014-01-01). “Resistive Threshold Logic”. IEEE Transactions on Very Large Scale Integration (VLSI) Systems 22 (1): 190–195.doi:10.1109/TVLSI.2012.2232946. ISSN 1063-8210. ^ James, A.P. ; Kumar, D.S. ; Ajayan, A. (2015-11-01). “Threshold Logic Computing: Memristive-CMOS Circuits for Fast Fourier Transform and Vedic Multiplication”. IEEE Transactions on Very Large Scale Integration (VLSI) Systems 23 (11): 2690–2694. doi:10.1109/TVLSI.2014.2371857. ISSN 1063-8210. Computation and Neural Systems department at the California Institute of Technology.